Abies kawakamii, first described by Bunzō Hayata and later completed by Keisuke Itô in 1909, is commonly known as Kawakami or Taiwan fir which is spelled as 台灣冷杉 in the Chinese language. Description. Taiwan fir is an evergreen coniferous species of tree which will grow to a mature height of 50 feet (16 m) tall with a 3 foot (100 cm) diameter trunk at breast height, growing with single, straight trunk and whorled horizontal branches. Its bark is gray-white, smooth and resinous, becoming gray-brown and scaly. Branchlets are deeply grooved, yellowish-gray to dark brown, with brown pubescence. Buds ovoid, very resinous, brown to reddish with obtuse scales, up to 0.04 inch (1 mm) in diameter. Leaves are linear, flat, 0.4 to 0.6 inch (10 - 15 mm) long, dark green above, whitish below, with some stomata on the upper surface near the rounded or notched apex. Pollen cones are cylindrical, up to 0.6 inch (15 mm) long. Seed cones are oblong to cylindrical, 2.5 to 3 inches (6 - 7.5 cm) long and by ca. 1.5 inches (3.5 - 4 cm) broad, maturing purple. Seeds are ca. 0.3 inch (7 - 9 mm) long with a 0.35 inch (9 mm) wing. Distribution. This species is native to Taiwan, where it is widespread at elevations of 9,000 to 12,500 feet (2,800 - 3,950) m above sea level in the central ranges, usually forming pure stands. Attribution from: Huang Tseng-Chieng, senior ed. 1994. Flora of Taiwan, Second Ed., Volume One, Pteridophyta Gymnospermae. Taipei: Editorial Commission of the Flora of Taiwan, Second Edition. 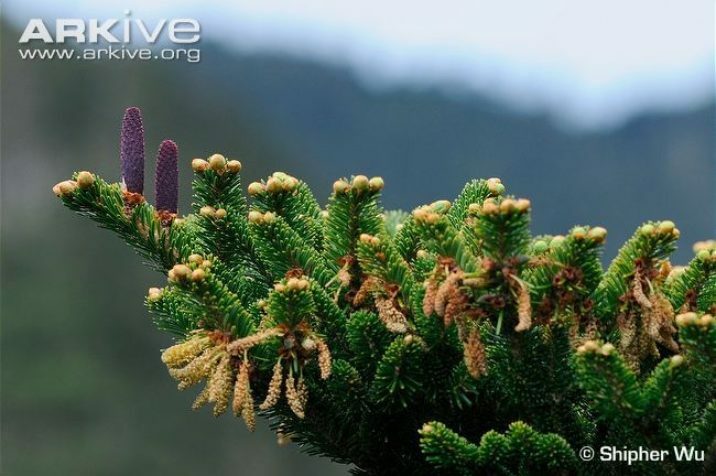 Abies kawakamii — an awesome display of pollen and young seed cones. 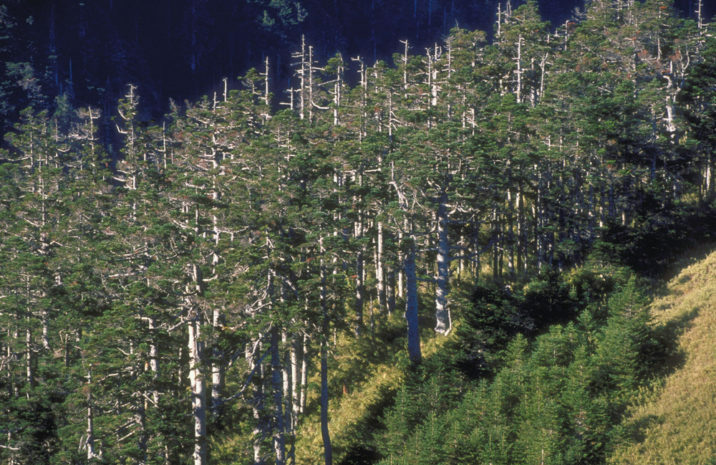 a stand of Abies kawakamii growing in habitat. Photo by Guang-jer Liou(劉光哲), via Ministry of Foreign Affairs, Republic of China (TAIWAN).